This temple is located 35 kms from Rajahmundry, situated between the rivers Vashista and Gautami, tributaries of river Godavari. The Devas and Asuras got together to churn the ocean for amirtham which would give them everlasting life. They churned the ocean with Mandramalai & Vaasuki, the snake. Whent he amirtham appeared, the Asuras greedily grabbed the Amirtham pot and vanished. In order to retrieve the Amirtha kalasam, Lord Vishnu took the form of a dazzling beauty (Mohini Avataram). The Asuras falling for her beauty, entrusted her with the job of distributing the Amirtham. Mohini started serving the Devas first. The Asuras waited their turn in vain. Lord Siva was enamoured by the beauty of the maiden. As he was following her, a flower fell to the ground form her plaited hair. As he smelled the flower, he realised that it was Mahavishnu in the form of a damsel. The spot where the flower fell is Ryali. (Ryali - falling in Telugu). Lord Brahma created a Lingam & performed abhishekam with water from his kamandalam & hence Lord Siva is worshipped here as Sri Umakamandaleswaraswami. Opposite this temple which is facing west is the Sri Jaganmohini Kesava Swami temple. 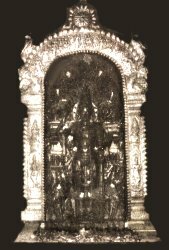 The idol here, is made out of a single saligrama stone with the form of Mahavishnu as Kesava Swami carved in the front & Mohini on the rear. On the front along with Mahavishnu with his conch & discuss are carved the forms Sridevi, Boodevi, Naaradar, Tumburu, Ramba, Oorvasi, Kinnara, Kimpurusha, Govardana Krishna, Adiseshan, Garudan & Ganga devi. 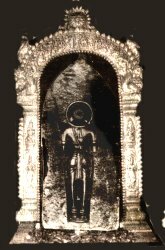 Water keeps sprouting from the underground at the idol's feet. This water wets the the flowers at the Lord's feet & the water from these flowers is sprinkled on devotees. There is a separate sannadhi for Sathya Naaraayanan along with Thaayaar Sri Lakshmi.